Relaxed and comfortable ankle high house booties make you feel walking on cloud. Thick and exquisite Coral Velvet fabric warm up your feet in cool or frigid weather. Nice indoor booties for women, smooth and fluffy surface with cute bowknot design, simple but elegant. 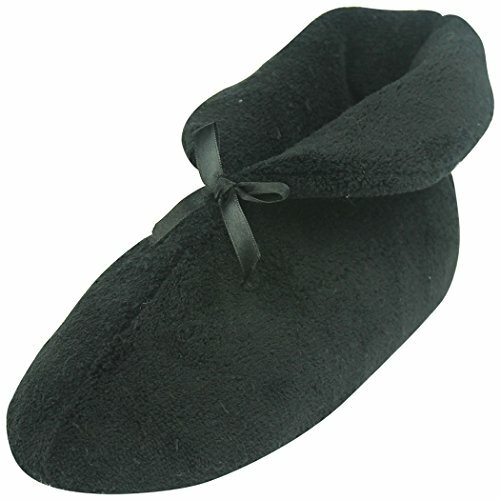 The sole of the slipper is made from high quality material which is soft and antiskid. Orderly dots on the sole increase friction for antislip and durability, and will not damage your floor or make big noises. PVC-DOTTED Sole has good elasticity and shock absorption for steady and safe walking, add more portability and comfortability. Please pay special attention to the size and sole length to find out what fits you most. Small: Suitable for women's shoe size 6, Sole length: 9.65inches. Medium: Suitable for women's shoe size 8, Sole length: 10.24 inches. Large: Suitable for women's shoe size 9.5, Sole length: 10.82 inches. X-Large: Suitable for women's shoe size 11, Sole length: 11.22 inches. If you have any questions, please feel free to contact us by email, we will try our best to help you. Don't forget to check our Home Slipper storefront, may be you will find your favorite slippers in surprise! If you have any questions about this product by Home Slipper, contact us by completing and submitting the form below. If you are looking for a specif part number, please include it with your message.